Man, Larry raises clueless to a new level. Sounds like Reade behaved herself, and Nelson is just happy to have gotten a good night’s sleep, right? Coming up-Stephanie and Larry fire up the discombobulationotron. Sine it’s a gateway to alternate realities, you never know what they’ll see. Or whom they’ll meet. Well, we all hope that Lyssa’s the first person they see, of course. And Victoria. 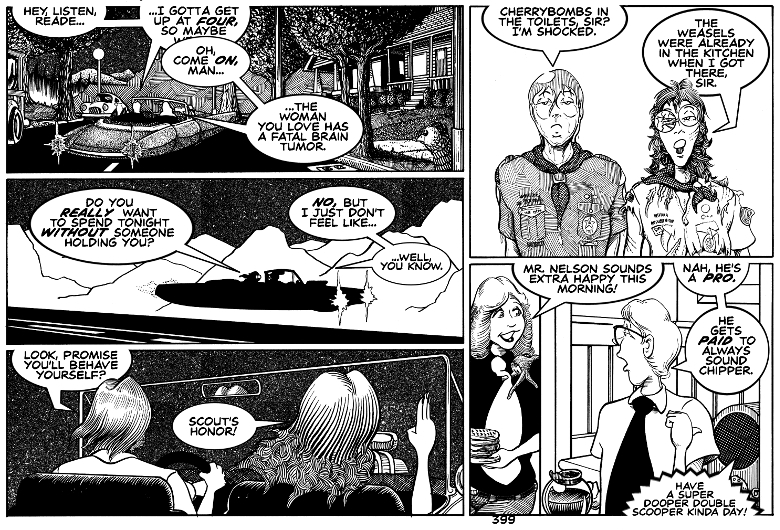 No offense, but the only person I would trust to have “scout’s honor” in this comic is Stephanie. Ulterior motives is this comic’s main export, though that doesn’t necessarily mean all the motives are bad, either. Are they driving a hovercar? How did I miss that they have a hovercar? Not just a hovercar, but it looks like a hover Caddy! A hover Caddy with a blower; I have got to get me one of these! Eleanor’s atomobilic hovercar is based off The Monkeemobile, which is a stretched-out, chopped down GTO. Also, he’s a better hovercar driver than Larry is. It was partly his driving, and some sort of reaction to the anti-gravity field. Doesn’t happen to everyone. I need to rewatch the Monkees now. Stephanie, Larry, Toivo, Robespierre, Edison, Nelson, Reade, Anya… Eleanor. Well, considering that neither Larry or Stephanie know what is going on between Nelson and Reade . . . yeah, Larry is clueless. Sure glad I wasn’t their Scoutmaster…although you would be left with a lot of great stories to tell. Me too. Especially Young Reed. I’m having a great time with them. It’s the deadpan expressions while they lie their young butts off that crack me up. Headaches, mostly. Headaches and great stories. Brilliance, pure brilliance once again. Nelson & Reade great dynamic. Robespierre reaching for the pancakes as well, hungry ‘lil stinker ain’t he? There’s some bacon waffles in that stack. We all know how Robespierre feels about bacon. That fourth panel! So funny, and naughty. Because everything is a euphemism. Also, this small size really doesn’t do your artwork justice. You could make a whole comic about the scouting adventures of Nelson and Reade, and it would be marvelous. I really love how in those first three panels, we don’t see Nelson and Reade’s face at all. Yes, Larry is literally clue-free, here. As for trustworthy, I think Toivo is utterly trustworthy, in his own way. It’s just such an UNEXPECTED way…. It’s because of the things they went through together in the Scouts that the phrase “Scout’s honor” still means something serious to both of them. Trust me. And “the weasels were already in the kitchen when I got there, sir” makes me giggle entirely too much.